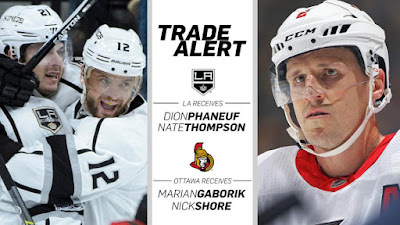 The Los Angeles Kings have acquired defenseman Dion Phaneuf and center Nate Thompson from the Ottawa Senators in exchange for forwards Marian Gaborik and Nick Shore, Kings Vice President and General Manager Rob Blake announced on Feb. 13. Phaneuf, 32, entered Feb. 13’s Ottawa-Pittsburgh game having played in 955 career regular season games. He has recorded 478 points (133-345=478 points) and 1,277 penalty minutes in his career. This season he has 16 points (3-13=16) and 34 penalty minutes. He has also played in 51 career playoff games. A three-time All Star in 2007, 2008 and 2012, Phaneuf was a member of the NHL All-Star Team (first team) in 2007-08 and a member of the NHL All-Rookie Team (first team) in 2005-06. Four times in a season he has played in all of his club’s games and he is sixth among all active players in penalty minutes. He has played with Calgary, Toronto and Ottawa in his career. The 6-4, 225-pounder is from Edmonton, Alberta. Thompson, 33, has played in 593 career games. He has recorded 11 points (4-7=11) and 10 penalty minutes this season. In his career with the Senators, Lightning, Ducks, Bruins and Islanders he has 122 points (52-70=122) and 309 penalty minutes. He has also played in 58 career playoff games. The 6-1, 214-pounder is from Anchorage, Alaska. “Dion brings to our club a great deal of experience and leadership. He also plays with a physical edge which complements our line-up well. Nate has a good reputation of being a high-energy player on the ice. Both guys are also high character guys,” Blake from Los Angeles said.